Block One is the “DC Botanic Garden,” which is very close to my home! I'm making two versions of my Mystery Quilt. The version with the gold fabric is Mon Ami from Moda and I love the little Kitty on it! The Navy version is my own Hometown Girl from Moda, available in quilt shops in Feb! I have constructed our block with squares, rectangles, half-square triangle units, and the outer points are done with the 'Sew and Flip' method. Inside the pattern I show you how to exactly place the 'Sew and Flip' units with photos. I am really excited to spend the entire year with you exploring Secret Gardens. 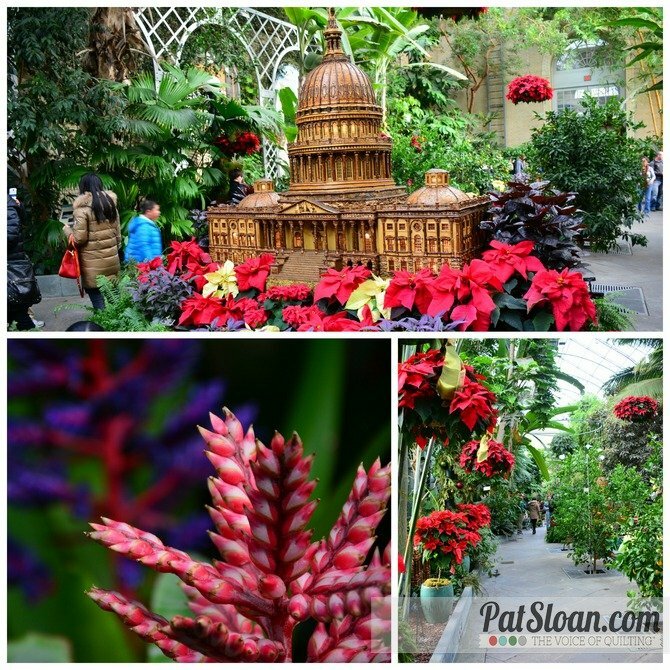 It's January so we head indoors to the DC Botanic Garden. This one happens to be close to my home. It is located right near the Capitol in Washington DC, literally steps away. What is so very wonderful about a Botanic Garden is that they are indoors for winter time, and you get to see a wonderful variety of flowers all in one place. They adjust the temperatures by room, so you might find orchids in one spot, and desert plants in another. 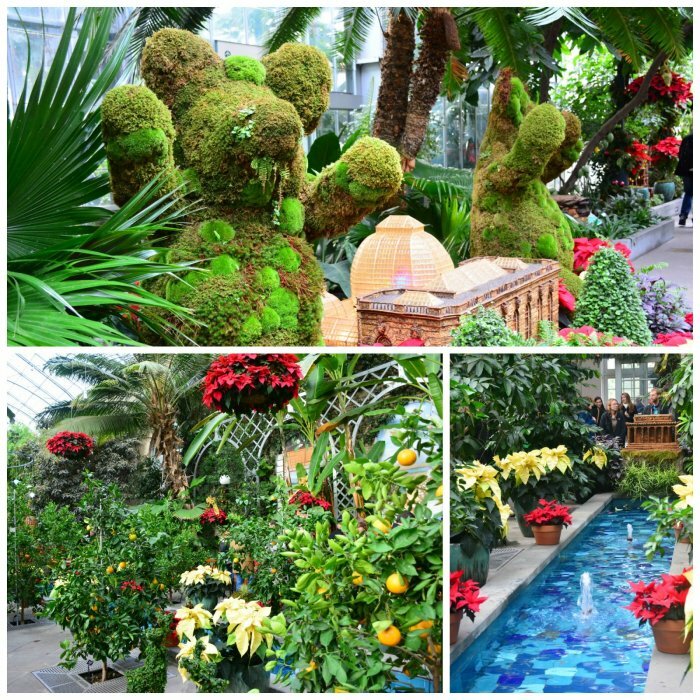 There are magical times to visit any garden, at the DC Botanic I love when they decorate in November for the holidays. They have poinsettias hanging in the trees and along the garden paths, yes.. there are paths inside! The reflecting pools and sculptures come alive with extra festival flowers, berries and greenery. Plus they run an adorable train through one whole section! When I need a break from the winter, my husband and I get on the metro train and ride down to the Smithsonian. From there it is a short walk over to the garden. When I step inside I'm transformed from the moment the warm air and sweet fragrance of flowers hits me. There is a wide lobby area as you enter, then we take a stroll through the different sections. I love seeing what is new since our last visit. My block this month gives me a feel of an indoor garden with all the annex areas off the pinwheel style center. When I saw the Mon Ami fabric with raindrops and little flowers I knew it would be perfect to make this quilt. 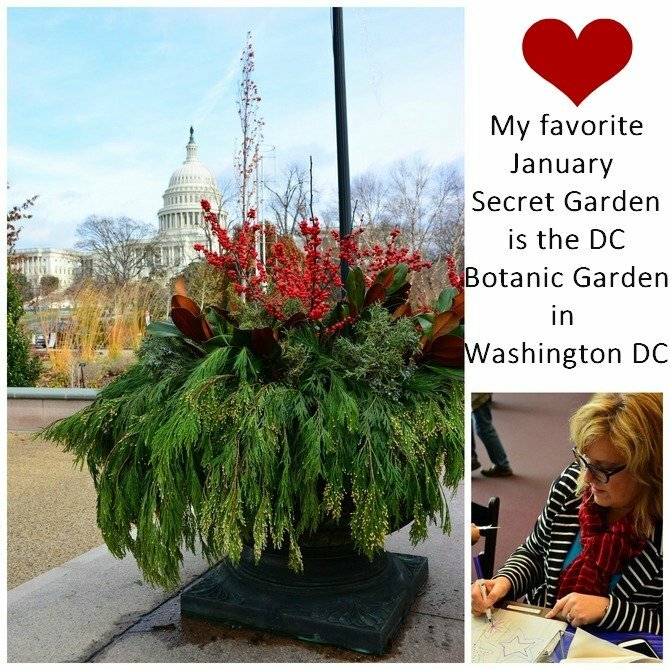 Learn more about the DC Botanic Garden here. I spotted a few other Botanic Gardens that I'd love to explore.. like Denver, St. Louis, and this one in Sydney Australia. Do you have a favorite Botanic garden? I'd love to hear about it! My Tutorial Video this month is how to determine you have an accurate 1/4” seam allowance. Watch all the way to the end to see how easy it is to be sure your 1/4” seam is correct. Each month I will have a new tutorial on a quilting technique for you.